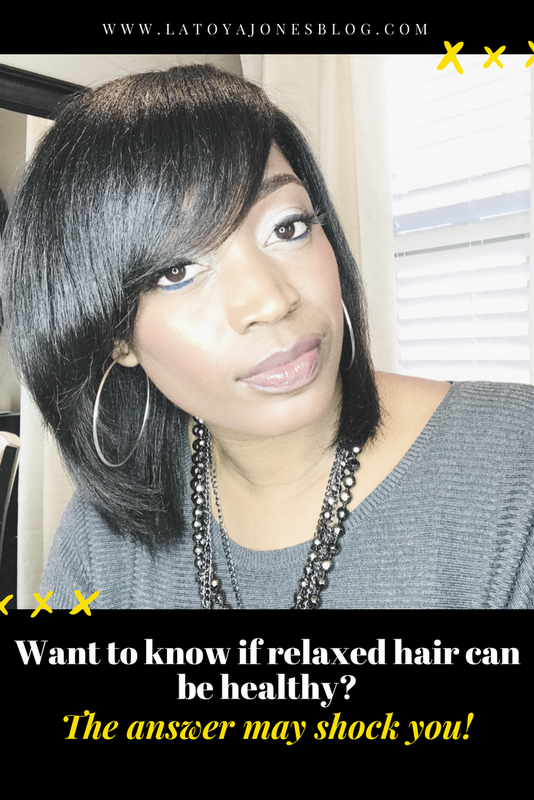 Want To Know If Relaxed Hair Can Be Healthy AND Long? The Answer May Surprise You! I get so many emails from ladies asking me if it is really possible to have healthy hair and have a relaxer. I'm here to answer this question for everyone that is wondering the same thing. Yes, you CAN have healthy AND relaxed hair at the same dang time! My hair is relaxed and it is very healthy. I have no breakage, no damage, no dryness, no balding, NO issues. And that is not only because I am a professional hairstylist. Even before I got my license I knew how to take care of my hair, which is the key to keeping your relaxed hair healthy. I do believe that any chemical, whether it be relaxer or color, can weaken the hair a bit which is why having chemicals means your hair will require special attention if this is the route you choose to go. Here are a few rules to go by when you have a relaxer. Stretch your time in between touch ups- Get your touch ups at a minimum of every eight weeks. In my opinion, any time before that is too soon. Getting your relaxers too close together can put you at risk for overlapping, which simply means that your hair that has already been relaxed will get more relaxer on it causing damage. I have reached my stretching goal of six months (24 weeks) to ensure that I have plenty of new growth and that no relaxer gets on any hair that has already been relaxed. Keep heat to a minimum- Relaxed hair does not require a lot of heat nor does it require heat to be used at high temperatures. I recommend using heat at a maximum of once per week or less. Keep your ends trimmed- You never want to not clip your ends because you want your hair to look longer. Sure split ends does make the hair appear longer, but it also makes it appear unhealthy also. The only way to fix split ends is to cut them off. Do this every 10-12 weeks or at every touch up appointment. Wrap your hair nightly- Wrapping your hair does so much to help your hair remain healthy. It helps your relaxers last longer and helps your split ends not occur as often. Need help with this? See the video below. This is pretty much all I do to my hair. I'm a simple girl and I don't have a lot of time or desire to spend a lot of time on my hair. I don't moisturize and seal nightly or anything like that. I use my by L. Jones Intense Moisturizing Treatment twice per month and that provides all of the moisture I need. I rarely even put oil on my hair, the only time I do is if it is a little bit frizzy but I never need oil for shine. If you are using good quality products like the by L. Jones shampoos and conditioners, you won't need to use a lot of extra stuff. That is why investing in great products is so important. When using cheap products, you have to use more to get the same results that you would get if you bought less of a quality product. You will find a lot more detailed instructions on how to take care of your hair in my ebook but these are the basics. Follow these steps and you will see that your relaxed hair can be healthy! Love your blog and congrats on your one year anniversary. I have healthy, relaxed hair but I do have more gray hairs than I would like especially around my edges and hairline. No bueno. I know double processing is not advised but what would you recommend for coverng up grays? I don't want permanent color but wondering if a rinse or semi-permanent color be better? Thanks so much for posting this! I hate that some people automatically assume that having a relaxer equals damaged hair. I know that this is not true, but it's good to hear it come from a stylist! I think women will be going back to relaxers in the future or finding some kinda way to get straight hair. But as of now I see naturals winning the game. I feel a lot of little girls will be rocking their grease and water plaits lol. Which is a good thing. I see natural hair being around for a while as well. Who knows it might just be the way we will continue to rock out hair. It is true that cheap hair care products may cause of hair fall and other hair related issues, so we need to choose a product that has essential ingredients without any harmful chemical. Nowadays several best shampoo and conditioners available to make our hairs beautiful and healthy. Also I think we should avoid to use heat on hairs as using heat on hair may cause of hair loss in women and men.